Day 7 -And the herd of Bison Charged Me and my Road King! Started the day as always – reaching and strapping my bag to the bike. It’s a ritual at this point but still has to be done right each time or there’s a good chance you’ll be missing something when you get where you are going. 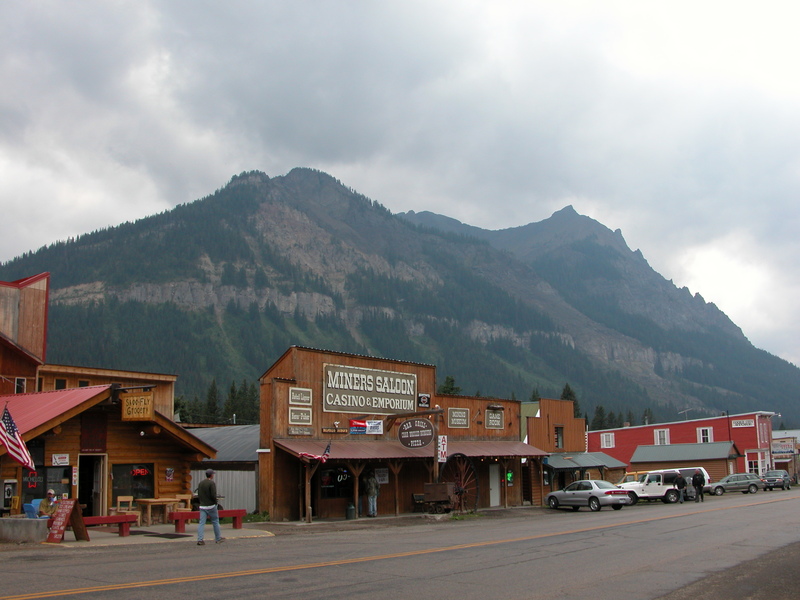 I got a few texts from Bert and Jamie (the utah guys who I met yesterday) saying they would meet me in Cooke City, a town 55 miles over the Bear Tooth pass and on the edge of Yellow Stone. The day will be long with a lot of intense riding so coffee and breakfast was a must. After fueling, I hooked up with some older guys from Calgary and rode 25 miles with them until we all pulled into a scenic view spot for a photo opp. The Bear Tooth Pass is the most scenic ride I have ever done. The twists were aggressive though not as challenging as yesterday’s Big Horn ride. All along the rider up to the 11k for peak there were people stopped and up for a conversation. Toward the 9,500 ft mark of the descent there was a sign indicating “This I Grizzly Country”. That wasn’t an encouragement to stop. However I did stop at “The Top of the World” – a small roadside cafe and gift shop offering my last opportunity for a bio break before re-engaging “Grizzly Country”. I would not be watering any trees in this neck of the woods. The rest of the ride down the mountain to the next town (Cooke City – Altitude ~7,800 FT) was pretty uneventful but I needed a break. The constant state of alertness added to the altitude was quickly zapping my energy. Now I’m in Cooke City, refueling and then getting some nutrients and ready to head into the park. After topping off my tank, the Miner’s Saloon seemed like a biker friendly establishment so I popped my head into this dark but seemingly authentic bar. It was pretty empty so getting a spot at the bar was not a challenge. The bar tender who was a spitting image of Owen Wilson both in terms of look and mannerisms asked me what I’d be having. Anticipating some more heat I took down two bottles of water and a bottomless cup of diet coke – the latter washing down my Advil to ease any aches that have arisen or will arise over the hours to come. The bartender who has been in Cooke City for 12 years and at the Miner’s Saloon for 5 is a wildlife researcher when he isn’t working and his preferred pastime is hiking. He recommended I order the Buffalo Ribs that are thinner than most people picture ribs and done with a dry rub. I went with this as well as a salad using ingredients grown by “Missy” down the road. The man two seats to my left was clearly a regular and joined the conversation saying that due to the climate things like tomatoes don’t grow but any root vegetable comes out incredibly well. The altitude and lack of direct sunlight were not conducive to above ground growing providing only 2 months of a season. As I waited for my food I listened to the locals in conversation. The core conversation topic was around which other locals went fishing that day and why the others didn’t. This was all I could interpret as they were slurring their words between sips of their screwdrivers. The bar tender came back and engaged in the normal “where are you coming from” conversation. After a week on the road I’ve pretty much got this down to a science and have become skillful at turning it into their story instead of mine. Fun Fact, this bartender has been charged by bears 3 times. Another fun fact, Bear Spray is only good for about 7 seconds per can meaning one should only spray for 2 seconds per blast and hold the rest in case the bear decides to charge again as as the case for this guy one time. Another fun fact, Grizzlies walk the streets of Cooke City often though normally at night as they search for food. The couple had little to say and sheepishly slid out the door. The bartender told me that the town has very low water pressure and it’s just tough when people use it without ordering. I understand the principle but the water pressure argument seemed like a stretch. After finishing lunch I headed out to the bike and put on my rain gear top as it felt as the clouds were starting to thicken. At this altitude rain comes without any notice and getting your primary clothes wet will inevitably lead to a freezing day. I had 200 miles to go and needed to stay dry. 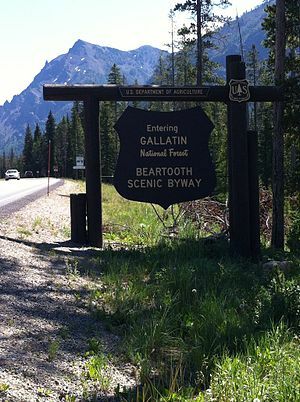 I would enter Yellowstone from the North East Corner and approach the 10 car line at the ranger station. In front of the kiosk stood a lady who most closely resembled Dana Carvey’s Churchlady character would ask if I already had a pass or needed to pay $20 for a new one. I showed her the pass that Mike and Chad from Red Lodge gave me (these things are good for a week). Churchlady asked me if I bought it or if somebody gave it to me. I didn’t want to lie and told her the truth – “it was a gift”. She said in a stern voice – “sir, you need to buy your own”. Then I smiled and said that I could’ve lied but didn’t. Charming her would get me nowhere as she ripped the pass out of my hand, tore it in half and said “you should buy your own”. She directed me to the kiosk ahead. As I got to the front of the station another biker pulled up next to me. ago I wrote about the importance to pay attention to such details. anti lock brakes by Harley. buckle with gloves). I was back out but a little slower. thing: Bison on the road. make it through quickly when they moved out of the way. After another 5 or 6 minutes the road was clear and cars started moving. pipes. I was a mile down the road before looking back. quickly departed, as I didn’t want to bear witness of Darwinism at work. trip. Later I’d be happy I made this decision. would get soaked. Again I pulled over and dressed in the raingear. Again – the Australians were there doing the same ritual. minutes. My check motor light turned on – “not now!” I thoughts. turned into the parking lot and jumped off the bike to get out of the rain. dense I couldn’t see the street. later learn was named Carlos and from Riverside NY about his destination. we exchanged numbers planning to pick up a future ride out west. actually reached the destination I saw a house surrounded by trailers. hotel. Luckily I found the last room at a reasonable price in town. walk to catch a few hours of sleep. Funny how these things often work out.